Damage around Aleppo’s Citadel. Photo shared on Aleppo Archaeology’s Facebook page. Aleppo Archaeology Facebook group has shared photographs of damage to Aleppo around the citadel, here. Photos of Aleppo came in first in the Nikon 100th Anniversary Photo contest. The Award was for “Next Generation Award：Photo Story”, and was won by photographer Adeeb Maher Sa. See the entries (one of which is featured above) here. The technical meeting about traditional building materials in Aleppo lasted for two days from 10 to 11 August 2017, and was held within the framework of the UNESCO-funded Emergency Safeguarding of the Syrian Cultural Heritage project. Updates on the meeting from the DGAM are available here. The National Higher Steering Committee for the Restoration of the Old City of Aleppo has begun the restoration work in the Old City of Aleppo through the Souq Al-Suqatiyeh area. As part of this, the Directorate of Antiquities, in collaboration with the Aga Khan Foundation for Culture, will hold a four-week course, beginning immediately after Eid al-Adha at the beginning of next September. The course is practical training on cutting and shaping stones. See this Facebook post from Aleppo Archaeology for more information. 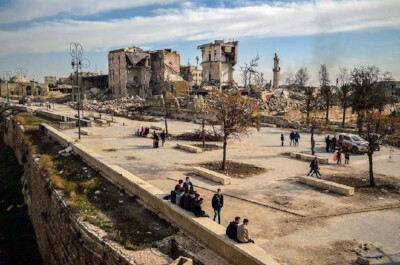 Jwanah Qudsi writes about Rebuilding Old Aleppo: Postwar Sustainable Recovery and Urban Refugee Resettlement for the International Conference on Sustainable Development here. The ATPA in Al Jazira Canton documented some of the archaeological sites in northern Al Hasaka: Tell Hamadi – Tell Jemilo – Tell Khatun – Tell Rashid – Tell Aluni – Ger Dawod. ATPA are also preparing to continue the second phase of Tell Bayder restorations (plastering and rebuilding the crumbled walls). This process will include Temple B and C, the southern facade of Temple D, and the Hellenistic palace and stores, here. Heritage and Risk Management: Athabasca University will be offering a new distance learning course, Heritage and Risk Management, for the upcoming Fall semester, September 5th to December 15th. Details here. The World Monuments Fund (WMF) is beginning to lay the groundwork for a new heritage conservation training programme after announcing plans last month to establish a £500,000 (US$648,000, €550,000) scheme for Syrian refugees to rebuild historic heritage sites, according to an article in Attractions Management. The work is part of an allocation from the British Cultural Protection Fund. The World Heritage Committee has published its decision to retain all Syrian World Heritage Properties on the list of World Heritage in Danger, here, along with several recommendations. The International Criminal court ruled that Ahmad Al Faqi Al Mahdi – the man found guilty of destroying World Heritage cultural sites in the Malian city of Timbuktu – must pay 2.7 million euros ($3.2 million) in reparations. However, it has been noted that the security situation poses a grave challenge to implementing the fund and compensating the victims, many of whom are displaced. Some of the lost cultural heritage of Homs may be viewed in a gallery in Istanbul, Depo. Echoes of Homs focuses on the stories of the Syrian city’s inhabitants and its now uncertain future. See the TRT World post here. On any given day there are at least 10,000 antiquities & ancient coins for sale on online, learn more from the Antiquities Coalition’s post here. The Economist spoke with ASOR CHI’s Michael Danti regarding the extensive damage to cultural heritage in the Middle East as a result of ongoing fighting in the region, here. The Syria Times writes about the devastation to Apamea, here. The Times writes “Antiquities experts call for war on Isis looting in Syria and Iraq”. First line says “British antiquities experts are calling for an international body to investigate and repatriate stolen artefacts to counter the looting and sale of antiquities”, so somewhat overblown.